Arriving at the mall this morning for the first time on foot, and hence seeing it somewhat differently, I was in full imaginative flight about how I could easily have been in the US. You know, how what we take for granted and just don't see any more at home is exactly the sort of ordinary thing that becomes exciting when visited in another country. 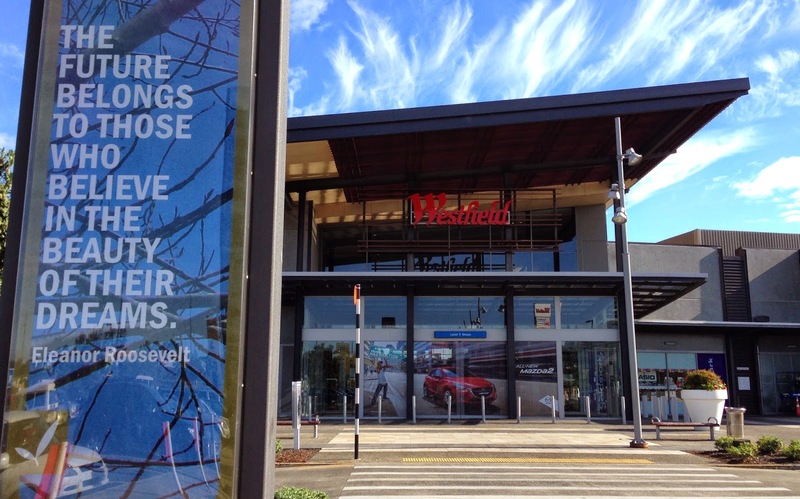 Literally exactly, since the totally interchangeable Westfield malls seem to be everywhere these days, especially in the States (which is quite a coup for an Australian company). I could even summon up the anticipatory buzz that I would have felt if I was travelling and not just filling in time at the local mall while my car was being serviced. I had already got to the bit in this pattern of thought where I value the after-effect of travelling that has you, if you pay attention, looking around yourself when you get home and seeing things with new eyes and appreciating what had become completely ordinary - the neatness, convenience, safety, beauty - when, approaching the entrance by a different route, I passed a series of columns with inspirational quotes on them including this one by Eleanor Roosevelt. While it's hard to equate this particular bit of hopeful thinking with Westfield's seen-one-seen-them-all shopping machines, it did remind me of the last time I came across the sainted Eleanor. It was in Washington DC, on an evening bus tour along the National Mall, when we stopped at the end to see that cluster of monuments - Lincoln, Vietnam, Korea, MLK and FDR - and I was delighted to discover that Eleanor has been accorded her own memorial near to her husband's. Though it's rather tucked away, it's still good to see that she was appreciated for the work she did and wasn't just seen as an adjunct to her husband - who probably wouldn't even have become President if it weren't for her. This was the first time a FLOTUS had ever been honoured like this. At first I thought the statue made her look a bit ordinary, in a coat, hands clasped as if waiting in a queue at the grocer's - but really that is her legacy, that anyone can make a difference if they want to enough. And the quote beside the statue could hardly be more apposite in these turbulent times where, actually, nowhere feels totally safe any more: "The structure of world peace cannot be the work of one man, or one party, or one nation... It must be a peace which rests on the cooperative effort of the whole world."